We are always striving for Tilley & Co Ltd to deliver the best all round service possible. By having a Scaffolding Company, this will speed up the job time, ensuring a much smoother service all round. Our Scaffolding team have over 80 years experience in the industry. 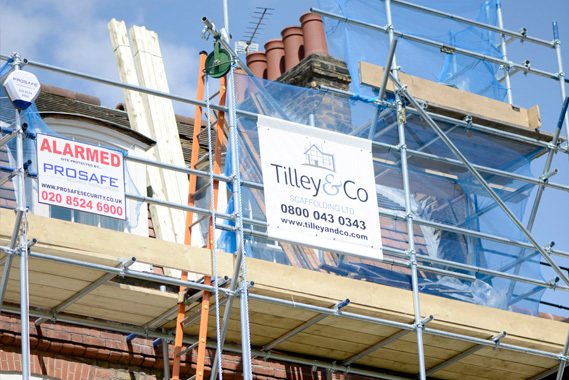 Tilley & Co Scaffolding Ltd is set up to offer competitive, smaller type, short period, local work in the Sussex area and attached counties, with the intention of offering a reliable, good standard personal service for the established and well known companies that serve this area. We would be happy to offer a competitive quote and a fantastic, reliable and safe all round service. The Tilley & Co Ltd team will all be in uniform and drive fully sign written vans. We are all fully insured and work safely and professionally. For a no obligation estimate, call 0800 433 2113 or 07787 866 174 today! We cover all of the South East of England. Your property is safe in our hands. Tilley & Co are fully insured for any 3rd party damage caused to buildings or personnel up to £2,000,000.00 with Aviva.